This set of IC Engine test focuses on “Engine Emissions”. 1. Pollutants are produced by the incomplete burning of the air-fuel mixture in the combustion chamber. 3. _____________is a colourless gas of about the same density of air. Explanation: No other gas except carbon monoxide, is a colourless gas of the same density as of air while hydrocarbons and nitrogen oxides have different densities. 4. Carbon monoxide is a poisonous gas which, when inhaled, replaces the oxygen in the blood stream so that the body’s metabolism can not function correctly. 5. Large amounts of CO concentrations, when breathed in, slow down physical and mental activity and produces headaches, while large concentration will kill. Explanation: No, even a small amount of CO concentrations, when breathed in, slow down physical and mental activity and produces headaches, while large concentration will kill. 6. The amount of CO formed ______________ as the mixture becomes more and more rich in fuel. Explanation: The concentration of CO is directly proportional to the mixture, that is why the amount of CO formed increases as the mixture becomes more and more rich in fuel. 7. A small amount of CO will come out of the exhaust even when the mixture is slightly lean in fuel. 8. As the products cool down to exhaust temperature, minor part of CO reacts with oxygen to form Co2. Explanation: No, but in fact, as the products cool down to exhaust temperature, major part of CO reacts with oxygen to form Co2. 9. If the combustion is complete, the only products being expelled from the exhaust would be water vapour and carbondioxide. 10. Air pollution is defined as an addition to our atmosphere of any material which will have a deleterious effect on life upon our planet. 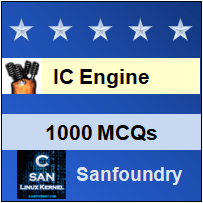 To practice all areas of IC Engine for tests, here is complete set of 1000+ Multiple Choice Questions and Answers.